What else could we do? Doors flew open, and we got the message. So in the midst of an already crazy schedule with huge adjustments being made already, off I went to find a house in Rio Rancho, NM. It took 4 days longer than planned (nothing really in perspective) but here sat a house that seemed to have been literally set aside specifically for us. No interest in the property for months and open houses unattended…ours was the only offer. This house was so nice it was rather odd it hasn’t just screamed off the market, lesser houses had but this one just sat there. The owner and I both remarked that it seemed Someone had this place in mind for us. The contract was signed, inspections passed with flying colors and off I went back to Denver to pack. Meanwhile, all the stuff of life still needed tending to and the holidays were about to converge on the calender. Busy became a newly defined word for us. Stretched? Huh, we were as maxed out as a human could get on every level. The verse on the various surfaces and constantly rolling over my mind was being tattooed every second of the day. I leaned on it, and joy bubbled within. Oh how we had been praying for God to move us out of Denver! An answer came, though the direction was not what we expected, nor hoped. It was around the beginning of December that Wayne Stiles book Waiting on God fell into my hands and I began to traverse it’s pages with much desperation. The legistics to buying the house were solid, but it seemed that we picked the one house that could not be sold as it was due to a new city zoning ordinance that was enacted right about the time I first laid eyes on it. It had to have a garage. The owner was in a real bad spot now having to deal with a huge hit to the pocket book. The search to find a way out of it began as my boxes filled up and our nerves began to be tested in extreme. The house has lost all and I mean all its appeal. We just want to empty boxes and return to a state of “normal”. Here – there, we don’t care. God’s will be done has been our prayer, fingers off the whole thing! We wait and ask only that our eyes stay tightly tuned into the process, the lesson being taught, the wisdom to be gained and light to be shared. The light grows dimmer in our vision, limbo is starting to feel like torture. Still no release. 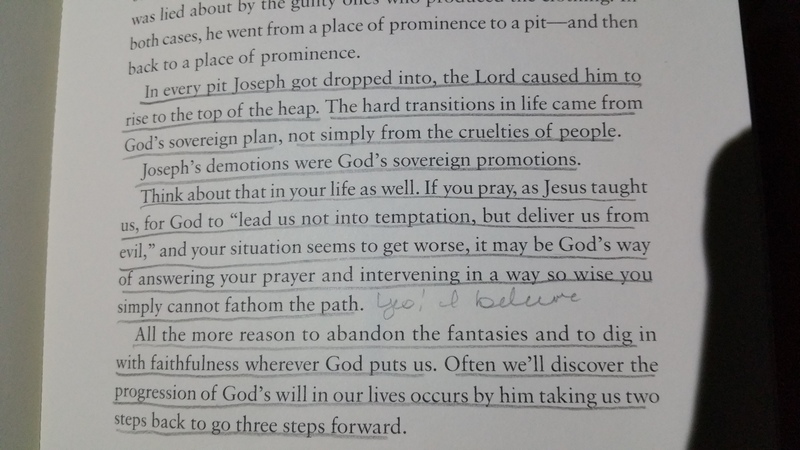 Then I come across this treasure of words from Abba, Waynes book. They shackled his (Joseph) feet with chains, and they bound him in irons; until the time when his Word proved true, God’s utterance kept testing him. Is it ironic that that verse in Jeremiah became a project for memory back in June? I don’t think so. I’m not big on coincidences, cause I don’t believe God considers anything such. Here’s a quote from Waynes book. The whole book centers on Joseph’s story. Wow, what I’m learning! Its clear the testing we’ve encountered is no accident, and just like Joseph, we do not see what all God is doing, most of what He’s doing, in fact! Somewhere behind hidden doors, God’s moving fast and furious, solidifying His will, not just for us, but every single person that has been and will be effected by all this. We’re not the only ones waiting. ..everyone connected to this is waiting, family, friends, realtors, lenders, neighbors, everyone! Waiting and watching very closely because God said to us to go and now He’s held us for a time at the crossing. People are weary of the prospect of saying “goodbye” to us where we are, others can’t wait for us to arrive. What a strange turn of events and the circumstances just lay in front of us, waiting for God’s green light. Whichever way He gives it, all will welcome the release. Stay or go, it doesn’t matter. Have my eyes stayed on You, my God and King? Is my devotion to You the brightest light? Oh, how my heart truly hopes so, dear Lord! May Your honor continue to stretch out my weary and waiting soul. Not for a house or for empty boxes, but Your Salvation displayed for all to see. Your beautiful timing and amazing will! Your strong protection and constant presence, no matter the situation! What a promise! Just like You were with Joseph, You are with us, through all. There is no greater gift! 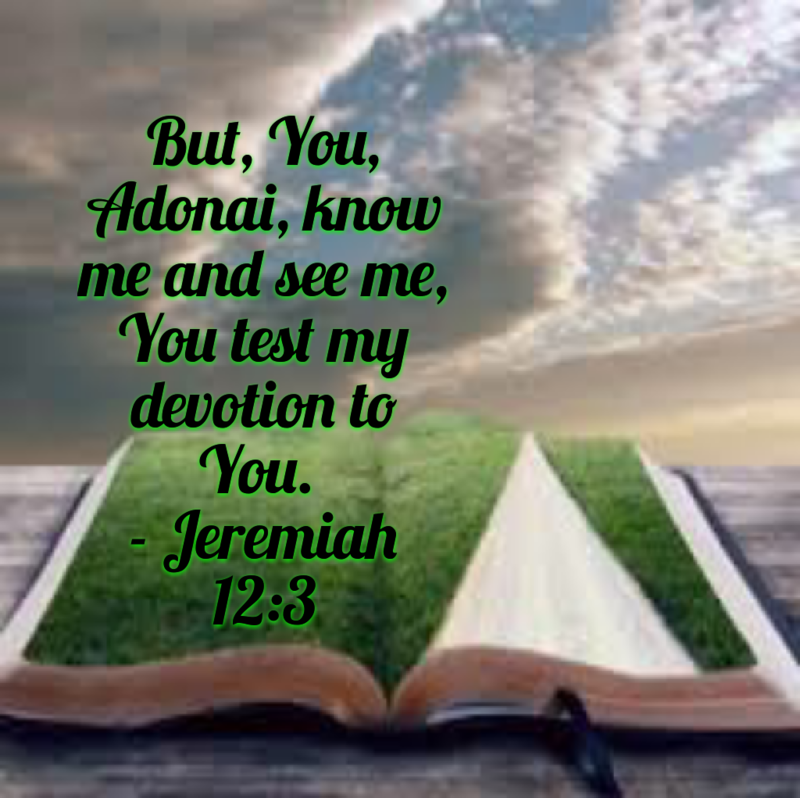 Test me, Adonai, and make true my devotion to You!